Incineration of Municipal Waste brings together the proceedings of two specialized seminars dealing with emissions from modern municipal waste incinerators and held in Copenhagen, Denmark: Incinerator Emissions of Heavy Metals and Particulates, held on September 18-19, 1985, and Emission of Trace Organics from Municipal Solid Waste Incinerators, held on January 20-22, 1987. The papers explore how modern stack gas cleaning equipment can reduce the emission of toxic substances, whether metallic or organic. Comprised of 36 chapters, this book begins with an overview of the fundamentals and salient features of energy-dispersive X-ray fluorescence spectroscopy for monitoring of heavy metals. The discussion then turns to gas cleaning methods such as dry scrubbing systems using slurry injection; measurements of mercury in flue gases from the Högdalen incinerator in Stockholm, Sweden; the performance of electrostatic precipitators; and the role of cadmium and mercury in municipal sohd waste incineration. 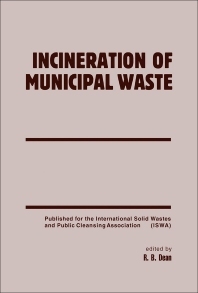 Subsequent chapters focus on the flux of metals through municipal solid waste incinerators; health effects of chlorinated dioxin and other trace organic emissions; and total organic carbon emissions from municipal incinerators. This monograph will be of interest to government officials and environmental policymakers.